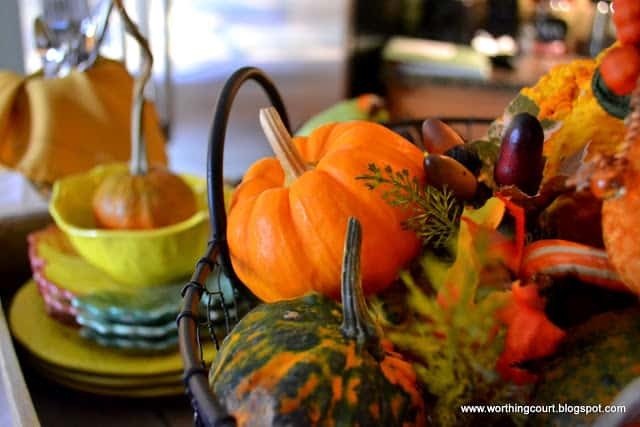 With Fall fast approaching, I’m bringing back a popular post from October 2011. My readership has grown quite a bit since then so I thought there may be some of you who haven’t seen these cute pumpkins before. 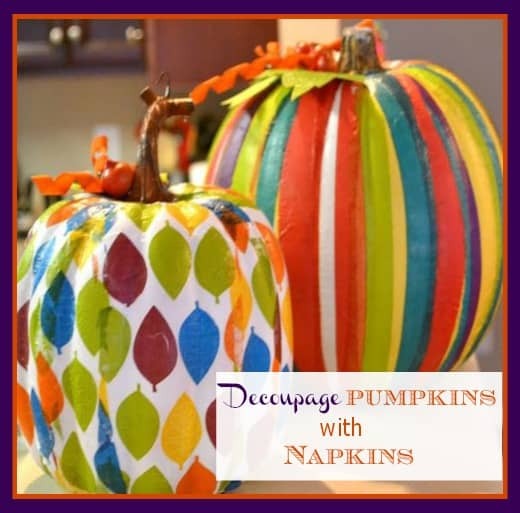 Here’s an easy pumpkin craft idea using ModPodge to decoupage decorative napkins onto faux pumpkins. I recently found some decorative napkins in all of the colors that I knew my daughter, Ms. J, would love. And as soon as I saw them, I knew just what I would do. 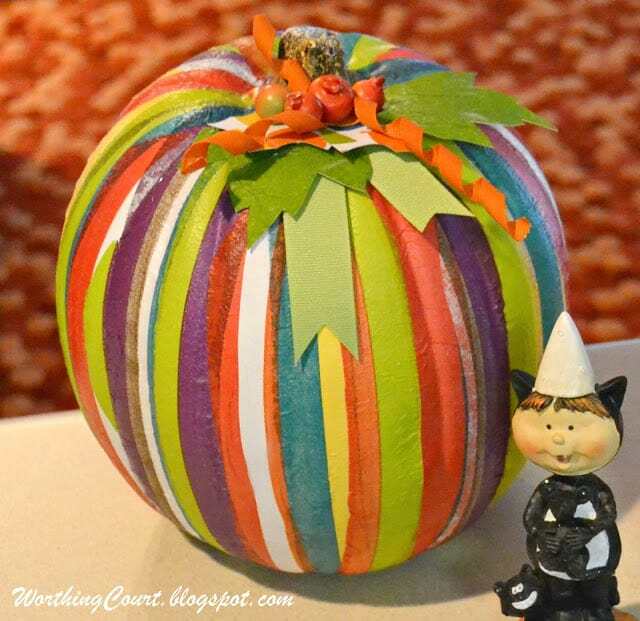 I picked up a couple of faux pumpkins at Michaels and went to town with the ModPodge. 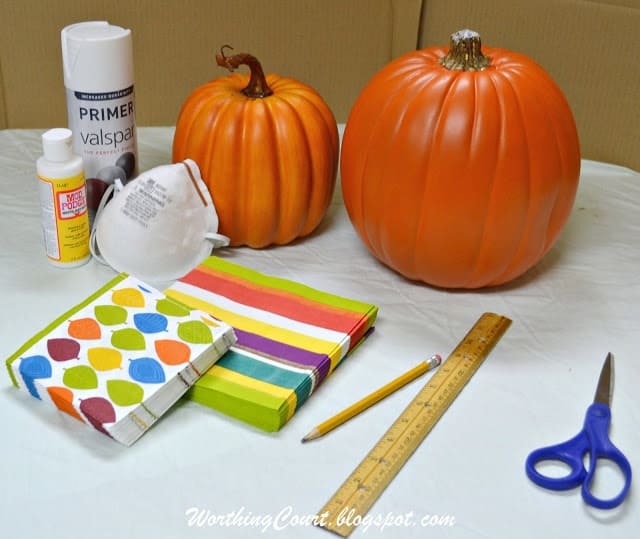 Faux pumpkins, spray primer, ModPodge, a spray mask, two different patterns of napkins, a ruler, pencil and scissors. I used a couple of other items as I went along that aren’t included in this photo, but you’ll see them below. 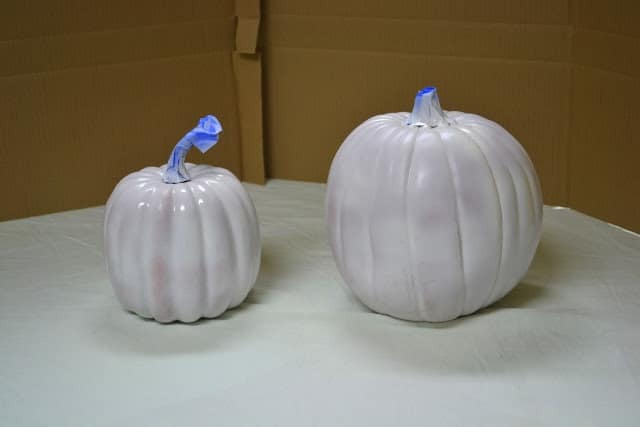 I started off by wrapping the stems of the pumpkins with painter’s tape. 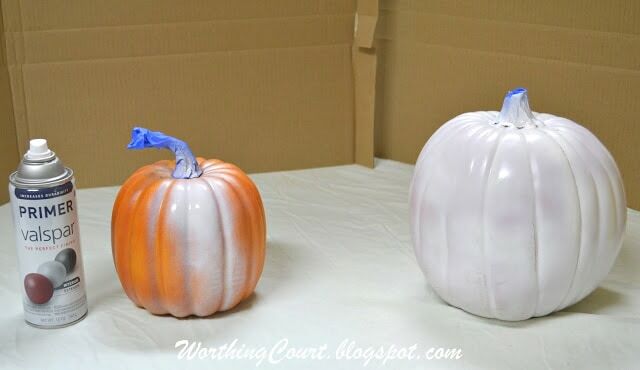 Then I spray primed the pumpkins so that the orange color wouldn’t show through the napkins. You’ll have to ignore the surface of my well used work table. I need to recover it. It really isn’t dirt that you see. It’s just places where adhesives have been used in the making of window treatments, cornices and upholstered headboards. It was looking a little naked, so you can see that I added some leaves, ribbon curly cues and berries around the stem. I’ll go into that process below. I covered the smaller pumpkin with the leafy napkins using the same process. I then cut out the traced around the leaves so they could be glued to the pumpkins. Next I made some curled pieces of ribbon to use. 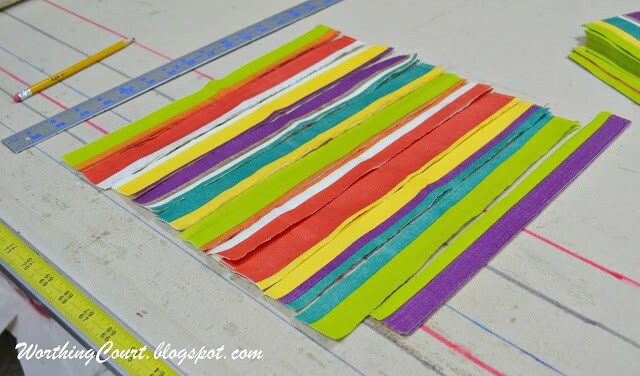 I simply cut some strips of ribbon, slathered them with Stiffy Fabric Stiffener, and wrapped them around a pencil until they were dry. 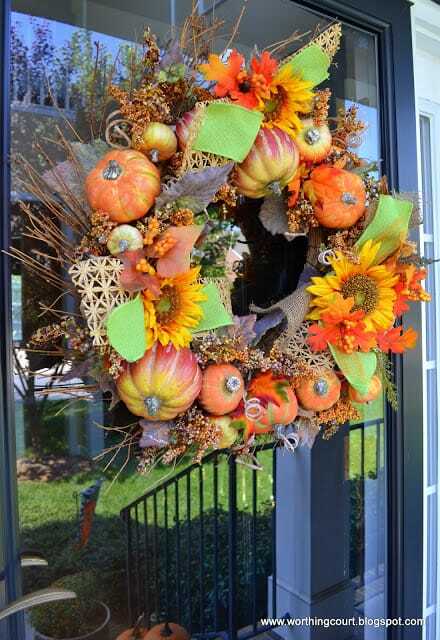 After that I just hot-glued the leaves and ribbons to the pumpkins. I added some strips of green ribbon too and a few faux berries. 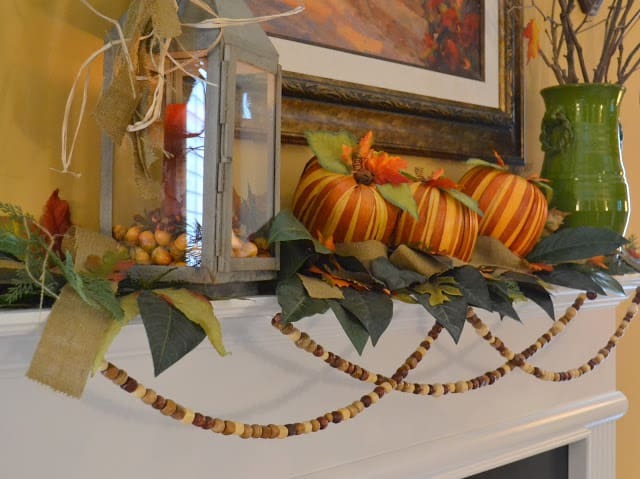 Check out these posts for more Fall ideas! I am so glad that you re-posted this as I did no see the CUTE PUMPKINS!! Just love the stripes and leaves! !..such a great “stem” idea!..Love them Suzy! How cute Suzy! I am pinning these. I thought about using tissue paper this season on some..but the napkins are a great idea too! Those are so cute Suzy! I love them and you are too creative! These are so fun and cute. Love them and great project. Too too cute! So glad you reposted for us newbies. My mind is all over the places with ideas! Thanks for sharing. What an awesome idea! I love it! Especially the tip about the ribbons! This is fabulous! i really want to ry this! So cute. I have to make these this year! 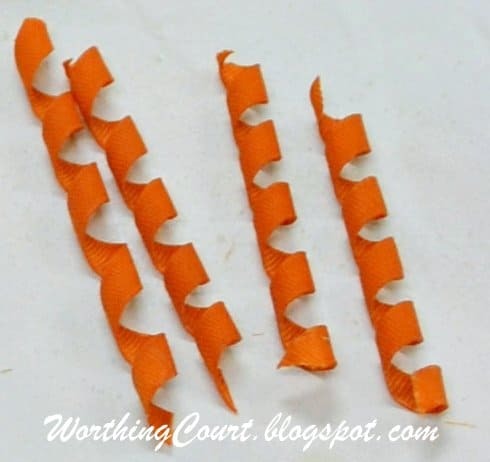 I love how you made the curly ribbon stems. So cute! 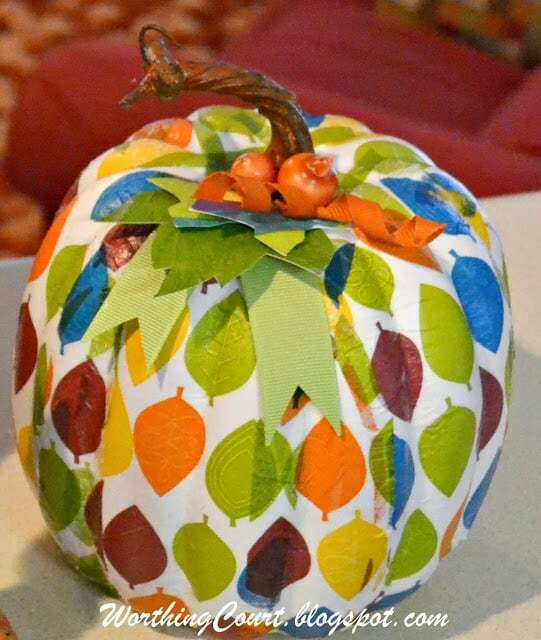 We have a pumpkin decorating contest at school and your napkin idea might be a good one to try with my kids. They look so good! 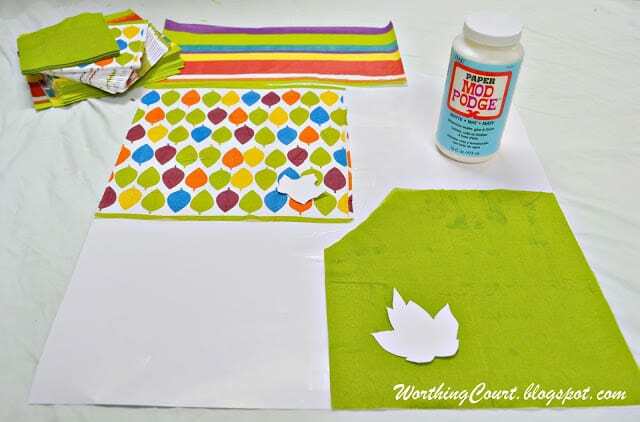 I love the napkin designs and they are so bright and cheerful. Love this idea!! How fun and festive! Those colors are awesome. 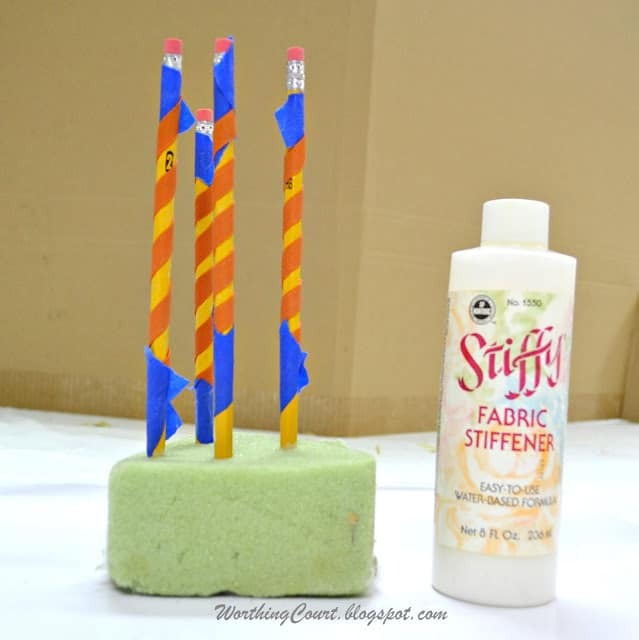 I’ve never tried that Stiffy stuff and now I’m going to have to add it to my shopping list. 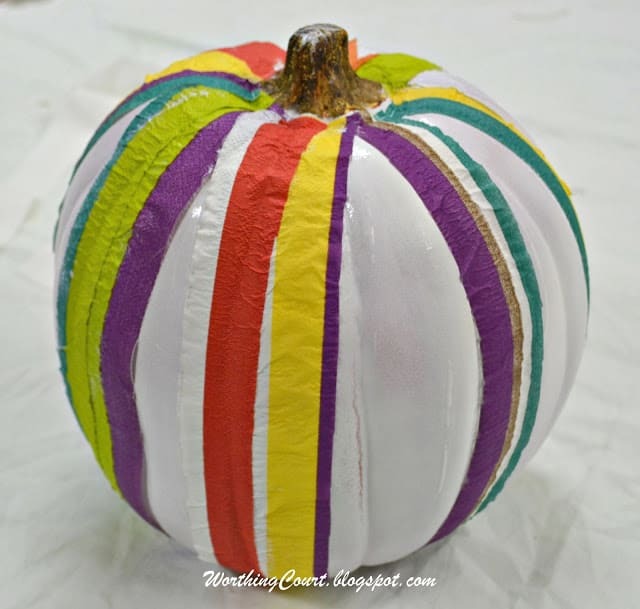 I hope you’ll link up to my Wickedly Creative Halloween Ideas Party. Napkins? What a great idea! 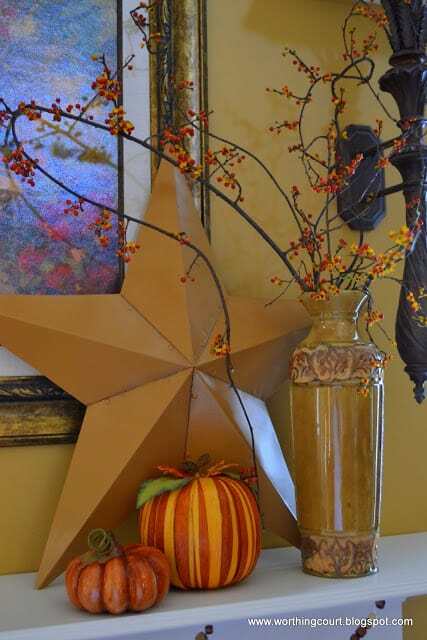 I’m all about making your holiday decor match your home not necessarily what is the standard! If you get a chance come link up your pumpkins at my Fall Edition Pin Party. These turned out adorable! I’m your newest follower. I hope you’ll visit me over at Posed Perfection and maybe even follow me back. Have a great week! So cute! You did a great job on these. Thank you for the step-by-step tutorial. She’s lucky to have you to make these cute things for her!! So, so cute! Pinning now! 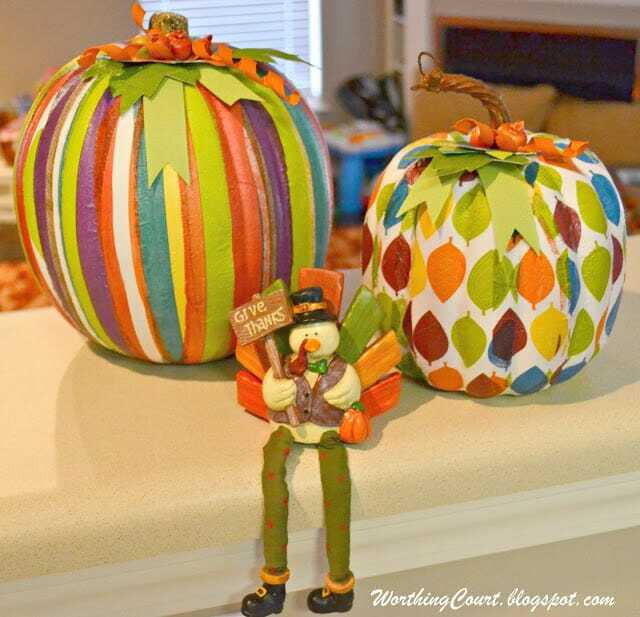 So crafty and creative! I can’t believe that you used napkins! Wow! 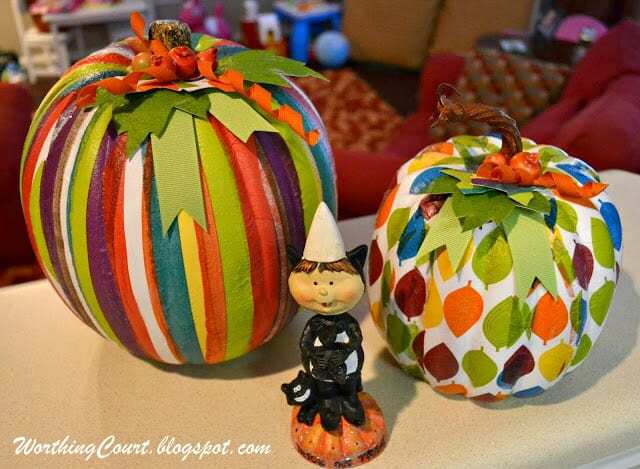 I’d love for you to share these pumpkins and any other projects at my new link party, Submarine Sunday. I hope you’ll stop by! I love how bright your pumpkins are!